The shoot is the production center for a plant. It is the organ system that gives rise to stems, leaves, and flowers. Therefore, the shoot system is functionally responsible for food production (photosynthesis) and reproduction. Shoots can be classified as vegetative or floral. Vegetative shoots are described in this article. Vegetative shoots consist of stems and leaves. The stem is the major structural support for the plant, but also contains vascular tissues that transport water, minerals , and food throughout the plant. Examining the organization of plant tissues within a stem highlights these functional characteristics. The outer regions of the stem are covered with dermal tissue made up of epidermal cells. These cells protect the stem and help to prevent water loss. Internal to the epidermis lies the ground tissue and vascular bundles. The organization of these tissue types within a stem varies with the type of plant. For example, monocotyledons have vascular bundles of xylem and phloem scattered throughout the diameter of the stem with ground tissue surrounding them. In contrast, dicotyledons have vascular bundles that are arranged in a ring surrounded by ground tissue. The ground tissue that lies to the exterior of the vascular bundle ring is called cortex, and the ground tissue that lies interior to the vascular bundles is called pith. 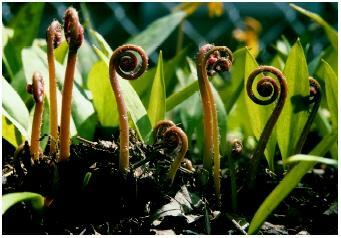 Young shoots of fiddlehead ferns. for growth or fruit production. The ground tissue, which constitutes the bulk of the stem, is mainly composed of parenchyma cells that produce carbohydrates (via photosynthesis) and store nutrients. However, the ground tissue also contains collenchyma and sclerenchyma cells that provide support with their rigid cell walls. On a larger anatomical scale, stems contain nodes, where leaves are attached, and internodes, the stem segments between nodes. There is usually a main shoot and side shoots, called branches. The side shoots grow from axillary buds that form at the nodes. In a young plant, most of the growth in the shoot system occurs in the main shoot and the developing leaves. During this stage, the growth is concentrated in the terminal bud at the shoot tip. The plant invests its energy into growing taller in order to maximize the plant's exposure to light. In fact, certain cells in the shoot tip produce a hormone , called auxin, that is transported down the shoot and functions to inhibit the growth of axillary buds. As the plant ages, the stimulatory effects of a group of hormones called cytokinins overcome the inhibitory control of auxin and the axillary buds begin to develop into lateral branches. This results in a bushier plant that allows for more leaf growth and greater exposure to the plant's environment. These hormonal effects are often taken advantage of in agriculture and gardening to manipulate the shape of a plant. Removing the shoot tip ("cutting back") will remove the source of auxin and will stimulate the growth of axillary buds, and make the plant thicker and bushier. Some plants have modified stems that serve a variety of different functions. Strawberries have modified stems called stolons that grow on the surface of the ground and allow the plant to spread and occupy a large section of nutrient-rich soil. Tubers, such as the modified stems of white potatoes, are specialized for food storage. Bulbs are also modified stems that are specialized for storage, and rhizomes are stems that grow laterally underground and are often mistaken for roots. Leaves are the major sites of photosynthesis in most plants. They are joined to the stem via a petiole and extend from the stem at nodes. While leaves of different plants vary greatly in size and shape, they have several similar cellular features that optimize photosynthesis. Like stems, leaves are covered with epidermal cells that protect the leaf from excessive water loss. Leaves, however, have specialized epidermal cells called guard cells , which surround pores called stomata . Stomata facilitate the exchange of gases in the leaf. CO 2 diffuses into the leaf through the stomata for use in photo-synthesis, and O 2 , the waste product of photosynthesis, diffuses out of the leaf through stomata. The vascular tissue within a leaf is organized into veins. The remaining tissue in the leaf is ground tissue. This ground tissue is composed mostly of parenchyma cells that have numerous chloroplasts in which photosynthesis takes place.